Welcome back to the Broadway Optometry blog! Your eye and vision health should be something you not only strive to maintain, but also improve. Oftentimes, people tend to place other aspects of their health such as weight management, dental health, and having a strong immune system (all of which are very important) over the health of their eyes. There are, however, small changes you can make to your everyday practices that can contribute to healthier eyes and sharper vision. As a Top Rated Local® eye doctor in Chula Vista, we have some tips for you to consider to take better care of your eyes. Today, let’s explore some of the healthy habits you can add to your daily routine to help maintain and enhance healthy eyes and good vision. Here in sunny Chula Vista, we have no shortage of sunshine. This can, however, be troublesome for your eyes. The sun emits ultraviolet A (UVA) and ultraviolet B (UVB) rays that are harmful to the eyes and can cause eye damage, including macular degeneration, cataracts, photokeratitis, and other conditions. Therefore, it is crucial to protect your eyes from sun rays when spending time outdoors by wearing sunglasses that safeguard your eyes from 99 to 100 percent of both types of UV rays. Talk to your optometrist to determine the best type of sunglasses for your lifestyle. Healthy eyes start with what you eat. Eating foods rich in lutein, protein, omega-3 fatty acids, zinc, and vitamins C and E can help prevent common age-related eye and vision problems like cataracts, macular degeneration, and glaucoma. Make sure to get your daily fill of proteins and nutrients from eating plenty of eggs, nuts, beans, green leafy veggies, carrots, fish, and citrus fruits like oranges and grapefruits. Living in the Digital Age makes it hard to break away from technologies like smartphones, computers, televisions, and tablets, all of which can affect your eye and vision health. Most people use at least one or two of these devices throughout their day, so it’s essential to give yourself a break from digital screens. Staring at a computer screen for extended periods of time can cause blurry vision, eye strain, dry eyes, headaches, and difficulty seeing at a distance. Along with taking regular breaks from your digital devices, you might talk with your Broadway optometrist about computer glasses as an additional form of protection from screens and computers. As your trusted local eye doctor in Chula Vista, your eye and vision health are our top priorities, which is why we provide residents in the San Diego area with quality eye health examinations for the whole family. To ensure long-lasting eye health, we offer comprehensive eye exams that test acuity, ocular motility, depth perception, and other essential eye and vision functions. If you would like to schedule an eye exam, call our friendly, knowledgeable, and compassionate eye care team at Broadway Optometry today. 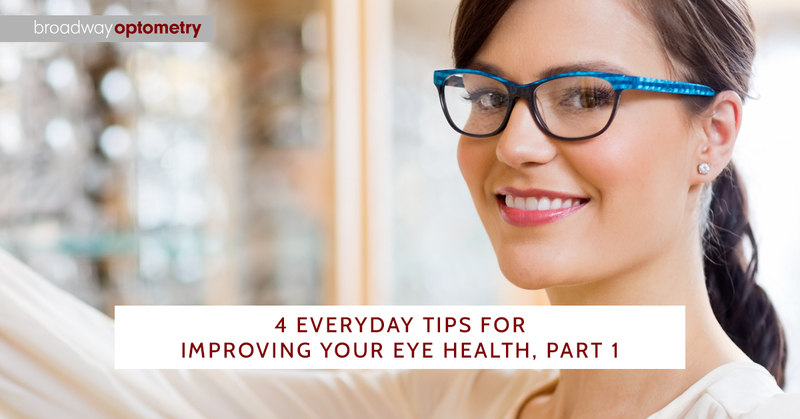 Be sure to check back for part two of this short blog series to learn even more ways to maintain your eye and vision health every day.